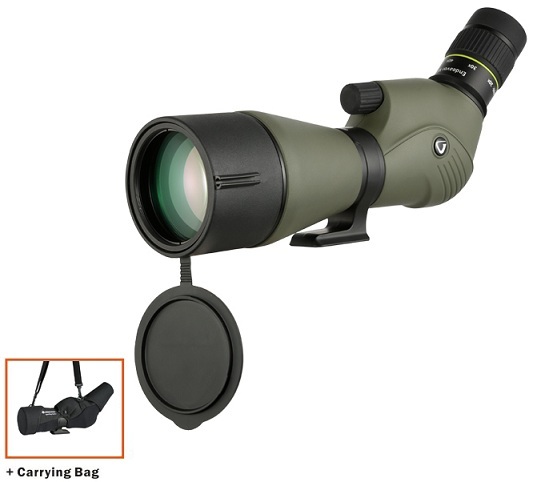 The Vanguard Endeavor XF 80A spotting scope boasts excellent optical viewing for nature enthusiasts and hunters. It features a rubber armoured magnesium body and is waterproof submersible, nitrogen filled and fog proof. The lenses are all fully multi-coated to ensure optimum light transmission and feature a phase-coated BAK4 roof prism. The Endeavor XF 60A comes with a 60mm objective lens and angled eyepiece with 15-45x zoom magnification. It features an extendable rubber covered eyecup and boasts impressive eye relief even at the highest zoom settings. It also provides a very impressive field of view. A built-in sunshield is included to eliminate glare in direct sunlight and it includes a padded raincoat with sling for carry and protection. Endeavor XF is equipped with a large smooth focusing wheel for quick focusing adjustments. The Endeavor XF mounts directly to Vanguard tripod heads (and others) that are equipped with the universal mounting plate without the use of a quick shoe. The tripod mount on the angled scope rotates to give optimum viewing angles in a variety of situations such as bench shooting and use with a window mount.